There are plenty of places to get a cup of coffee in Leeds, but the problem is, most of them are very bad indeed. If you want the best part of a pint of steamed milk with a shot of badly roasted espresso in it, there’s a Starbucks or one of it’s clones on nearly every corner. But there’s better coffee out there. Much better. You just need to search out the exceptions. La Bottega Milanese is very definitely one of these exceptions. 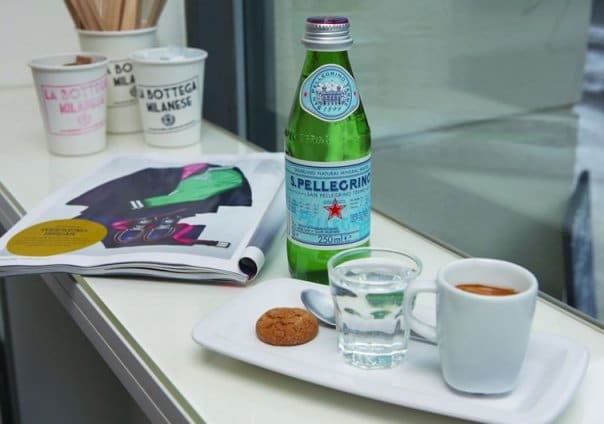 An authentic Milanese coffee bar tucked into a small part of The Calls, La Bottega is run by an enthusiastic Italian, Alex, with a real and very, very obvious love of his craft. I’d heard a lot about La Bottega since they opened last December. They’ve caused quite a stir and developed a strong following, so it was inevitable that I’d pay them a visit. I didn’t expect to be recognised straight away, though! Alex had read this blog, and said that he’d been expecting us. I had a straight shot of espresso, rich and rounded with a thick crema. Excellent coffee. Very, very good indeed. I followed this with a cappuccino, a first rate example of the form, the rich espresso mellowed by the steamed milk under a frothy cap of foam. Alex told me that he has his beans roasted to his own specification, a typically Italian roast. An Italian roast is normally lighter in colour and less oily than a more common French roast or – God forbid – the nearly cremated beans that Starbucks use. This is an important point. The taste of the finished drink is entirely dependent on the quality of the beans and the way that they’re roasted. Paying attention to the roast pays dividends in the cup. Whilst we were there, several other customers came and went. Each was warmly greeted and had a chat, each waited for their drink to be made from scratch. Nobody’s order was rushed. Everybody got a great cup of coffee. Alex had time for everybody who walked through the door. Just as it should be. La Bottega Milanese is a wonderful little place, a great example of the type of small, independent, artisan business that Leeds should be proud to have. Great. Independant coffee shops should be championed. I wish La Bottega the very best – In bocca al lupo! Agreed. It's so refreshing to stumble upon someone who's clearly passionate about what they do and who wants to deliver a first-rate customer experience. It's a little out of the way, but worth the extra five minute stroll. Alex does an excellent hot chocolate too, if coffee's not your thing. Im glad you liked it! It drives me potty when people ignore places like this to go to starbucks! It is great that little places like this can still survive amongst the big chains. It is just unfortunate that overpriced, badly roasted and not-quite-hot milk i.e starbucks still seems to be the order of the day. Love your blog, I am a fellow foodie from Barnsley, I hope you will pay me a visit. Natalie, it is good that small places like this exist. Actually, it's vital. Starbucks et al don't serve the best coffee, but they have created an environment in which smaller players like La Bottega can gain a foothold. If there's one thing Starbucks does best, it's opening up markets. More on this later! I'll definitely look up your blog, too.